This game is set in the Viking Age of Exploration and joins the mythical hero Erik the Red on his voyage from Iceland to Greenland. The background consists of two beautiful Viking ships sailing on a crystal blue sea amidst some touring icebergs. Prepare to set sail on the ultimate Viking voyage with Erik the Red! 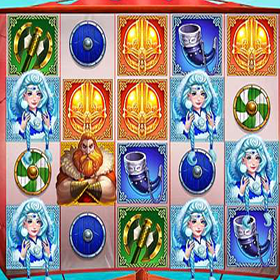 This fun-filled slot features Eric and Helga, our vikings, and has been developed by the creatives at Relax Gaming. 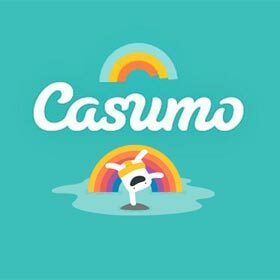 Sign up for the adventure today and get playing at Casumo now! Set in the Viking Age of exploration, join the mythical hero Erik the Red on his voyage from Iceland to Greenland. With two beautiful Viking ships sailing on a crystal blue sea amidst some touring icebergs, the background is amazing. The game’s action takes place aboard Erik’s ship, where the 5 reels have been mounted against his red sail. Like the Thor slot, each of the symbols of the game has been beautifully designed to tie into this historical theme. The lowest paying symbols of the game are 3 round shields in red, green and blue, as would often be found hanging from the sides of the Viking longships. The mid-range symbols are also coloured red, blue, and green; a red helmet, a green axe, and a blue horn. The highest paying symbols are the exquisite Helga gowned entirely in blue, the noble Erik himself, and the Wild which is emblazoned upon a sword. The game also features a scatter in the form of a small tree-like knot. Every symbol has been crammed with detail, making this game a true feast for the eyes. To make the voyage a little more interesting, the Gods (or at least the game developers) have ordained for some special features to appear. The first is the Mystery Stack Feature. At any random point during play, one symbol will be stacked across all 5 of the reels. This is going to land you a fantastic win! The other major feature is the free spins. To unlock these, you need at least 3 of the scatters to land on your reels. Then, you will be awarded 8 free spins and brought through to the mini-game! During the spins, additional scatters may appear. These are counted in the WILD meter at the top of each reel. When 4 scatters have landed on the reel, it will become a stacked wild and grant you an additional free spin! You have a little extra bonus to help you reach your stacked wild sooner! Remember which reels the triggering scatters landed in? These reels will have a small head start with 2 of the 4 scatters already being filled in. It is possible to collect stacked Wilds across all 5 of the reels! Will you manage to grab them? 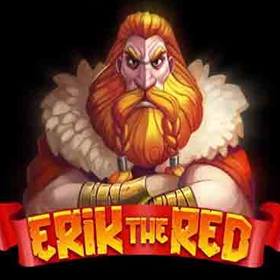 Erik the Red is a fun slot worthy of its legendary name. There is plenty to both see and do while the game fully remains easy to play at every turn. 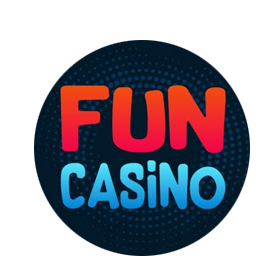 Whether you are a new player looking for your first venture or an old hand looking for your next conquest, we are sure you are going to love playing this. If you are a fan of all things Viking then you definitely need to spend some time here. Happy playing! You can play this slot machine game and 100s more like it at Casumo. Joining is easy and only takes two minutes. Deposit today and get a staggering 100% Welcome Bonus up to £300 plus 20 free spins.